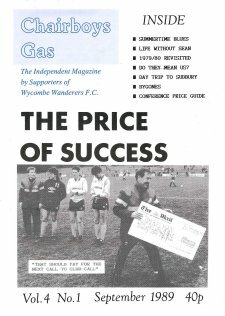 Season 2014-15 saw Chairboys on the Net continue the digital re-issue of supporters' fanzine 'Chairboys Gas' in order to mark the 25th anniversary of its original publication. Having seen its debut issue published during the promotion winning season of 1986-87, the 1989/90 campaign marked the fourth season (and what would be the final season) of publication. The final issue published in March 1990 would be the 25th issue. Having finished the 1988/89 in 4th place in the Conference, expectations were high for the following season - a season which would also be the last at Loakes Park before the move to Sands. Relive the Chairboys Gas commentary from season 1989/90 by downloading the PDF's below. These were published to coincide roughly with the 25th anniversary of their original publication date.